“They are neither dead, nor are they aflame. They manifest energy, but not in the hurried and impassioned way of flames, whose will to illuminate with pomp and brilliance leaves them sooner extinguished or reduce to a flicker. It is in contrast to this that embers show their virtue. From Professor Constancio Bernardo’s atelier, this vertical image to my atelier and the horizontal mural were photographed. 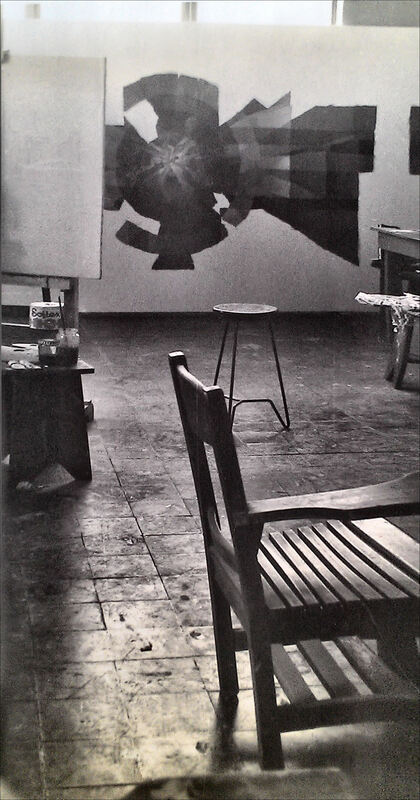 His introspective presence could be felt throughout the studio, the left wing end of Gonzales Hall. I seldom hear his voice except when I approach him for guidance, regarding my work. His soft voice and smile would calm one to the core of his being. His quiet, caring presence is the reason why I produced a lot of works at my own corner. This mural at the end of the room was almost halfway done. It is about the Filipino identity. Here, I incorporated the contrasting “Tagbanua and Mangyan” Pre-Spanish phonetic-syllabic handwriting; the Philippine flag – in a very abstract way; and at the center of the composition, are “embers” that symbolize the Filipino’s burning love for his beloved country. When completed, somehow it found its way to a prominent wall at the Humanities building, not too far from the College of Fine Arts, through the Arts and Sciences (AS) building. After a year or two, the Dean of Arts and Sciences, Dean Cesar Majul, requested me to see him at the office, only to find out that he wanted my mural taken off the wall. And, in a not so pleasant tone of voice, he told me that my work does not truly represent “Filipino nationalism”, because the sun only had eight rays. 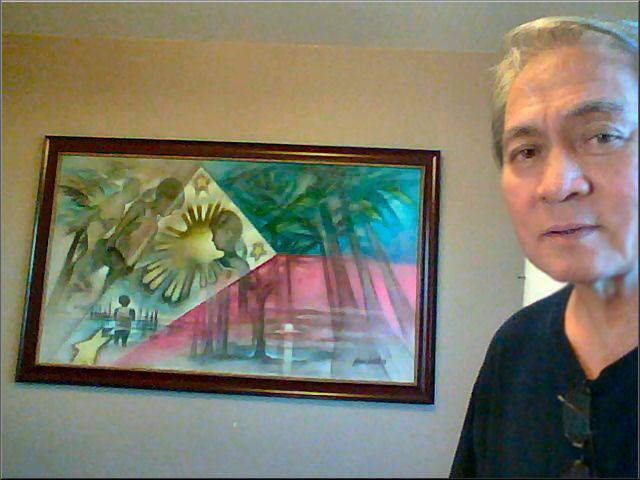 Surprised, I asked him why – – for from what we all know, the Philippine flag has always displayed a sun with eight rays. Well, he said, that ought to change. It should be nine so Mindanao would be properly represented. 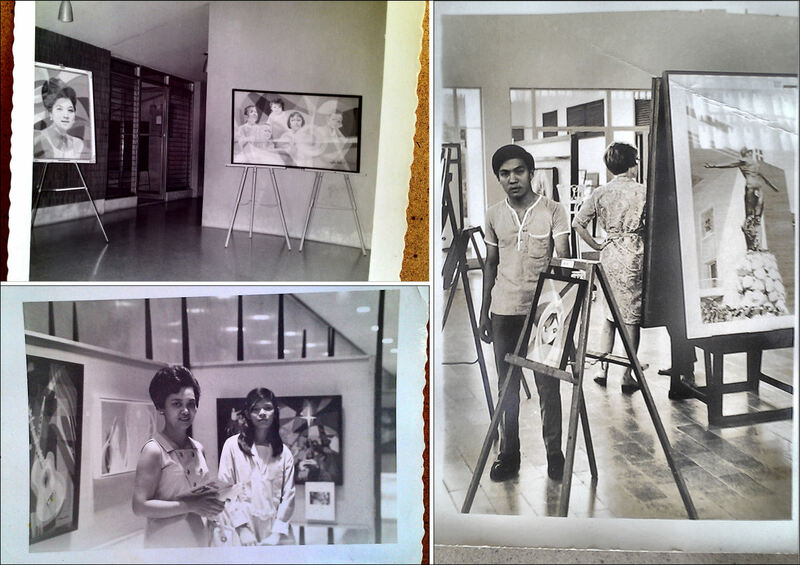 This story got around until it reached the ears of Art Critic – Curator, Emmanuel Torres of the Ateneo Art Gallery. 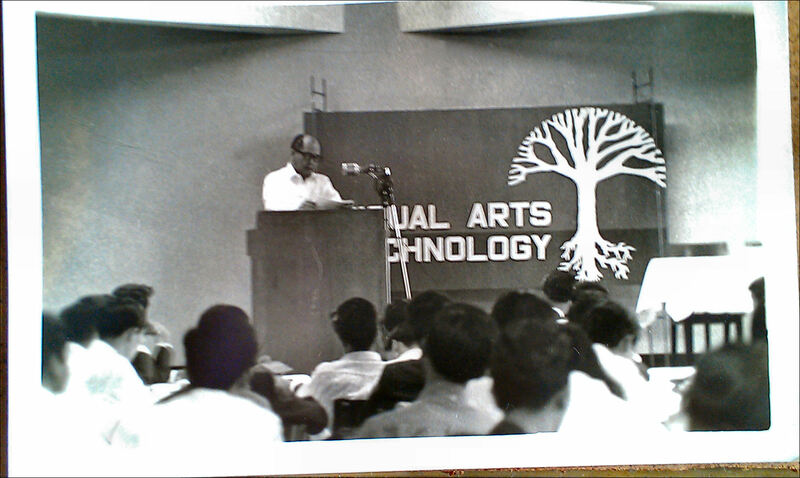 “Eric”, as I had gotten used to calling him offered that it be exhibited in one of the buildings at the Ateneo University in Loyola. 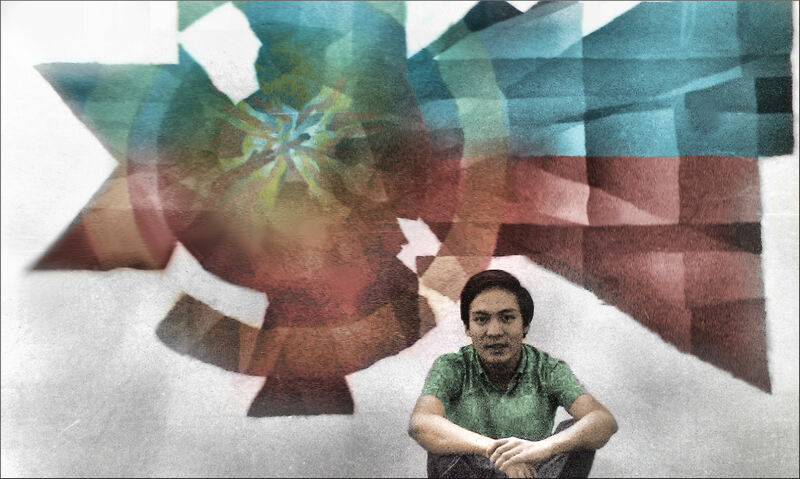 So, before I knew it, the mural, “Nationalism” for some years had been with Ateneo. A day came, when I was requested by my younger brother, Johnny, to accompany him to Legaspi, Bicol to ask for the hand of her girlfriend, Tess for marriage, to which I readily agreed. Before meeting with Tess and her parents, Don Kiko and Dona Nidea, we had to stay for a few days at the Mayon Imperial Hotel. Surprising as it had been with my mural, is another more surprising view that came to me at this hotel. There it was, prominently hung at the very center of the lobby, was my mural, “Nationalism”! Although bewildered by what has happened without my knowledge, I decided to forego any further inquiries as to what happened to my mural. One day, I reunited with an old friend, a very famous and acclaimed Filipino architect and Interior Designer, Lor Calma. 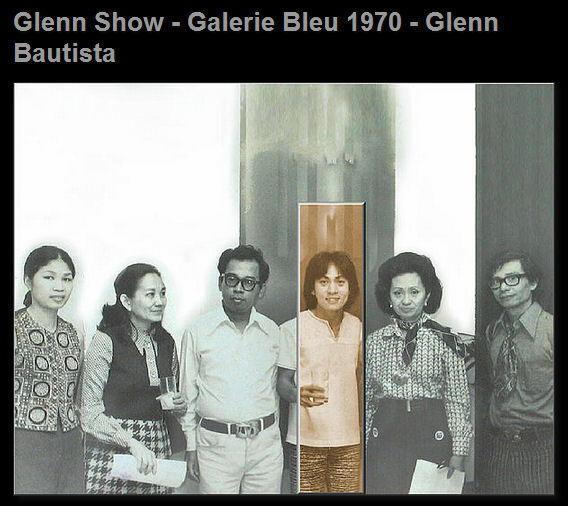 He, together with Arturo Luz, according to Artist/Professor Rod Paras-Perez, had always liked my “Diptych” minimal abstract series and wondered if I still had some of those which I exhibited at Galerie Bleue – (ribbon cut by Madame Imelda Marcos – choice of Mrs. Tantoco). Well, I said, you should be the first to know because Rod told me that you had purchased most of them. Anyway, to cut the long story short, because of that meeting with Lor, I discovered that “Eric” sold my mural, “Nationalism” to somebody, (or to him?) the mural that he liked so much, now prominently displayed at the Mayon Imperial Hotel in Legaspi, Bicol. Lor treated me to a lunch at the resto at the top of the Meralco theatre, one of which was the “snails” cooked with coconut which I really enjoyed breaking and supping. We also had long phone conversations before I left for the US, last May 2009. Before I left for the US, I had met “Eric” a few times at Gallery Genesis and other art openings, but nothing about the mural came out of his mouth. This blog will be followed by a short article I will write about my mural, “Nationalism” for my own sanity. I will upload it tomorrow. I thought of digitally reminiscing about the colors I used for this artwork. 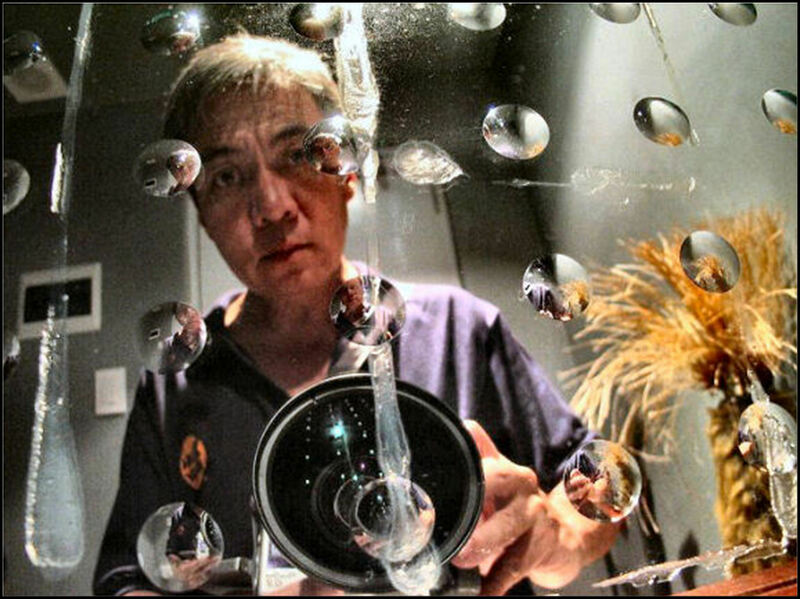 Possibly one of the most problematic tasks is the analysis and interpretation of an art work. The difficulty is most keenly felt when one’s subject belongs to the visual arts, like a piece of sculpture or a painting, since these arts present their elements as contiguous to each other in space. In short, these elements are presented simultaneously. It is true that the eye wanders from one element to another casually, or else, if sensitive enough, is guided by the very structure of the artwork itself, thus giving a succession of impressions. And yet the elements remain constant and firm in their allotted positions in space, aloof to time. On the other hand, interpretation as expressed in language must necessarily take the form of a series of assertions, following each other in time, for it is the order of language to be linear, both in speech and writing, for it to be intelligible. This essay and the mural it speaks of, therefore, are realized in different dimension that seem to be exclusive of each other. At best, the mural implies the essay and the essay is dependent for its meaning on the mural, but the mural is an independent, self-isolating creation, whose meaning is itself. Nevertheless, these are what our eyes see. The most easily noticed are the embers, or, more exactly, the shapes that represent the embers. Their glow alone is enough to attract the attention. Moreover, they occupy the most central position within the frame, or the pictorial field, a position which is always perceived as most dominant, even in such a mundane activity as having a group picture taken, wherein the center reserved for the more important figure. The embers may supply us with some idea to hold on to in our attempt to abstract meaning from this mural. Truthfully, we can thing of the embers’ glow, subdued light, and enduring warmth, and, in the context of such phrases in poetry as “embers of an old love” or “generals who kept alive the embers of resistance,” we can think of “slowly cooling emotions, memories, ideas or responses from past experience that are still capable of being enlivened.” Rather than wax poetic by musing on this image alone, it is perhaps wiser to view it in context, for after all, we have only begun. The series of concentric circles that frame the embers serves not only to call attention to the central image, but also to pick up the radiating lines of the twigs, the glow’s very fuel, and guides our eyes outward, giving us a sense of the organic vitality of the embers by ending with a ring of green, before finally letting our eyes settle on four flags. Surely, these flags must be significant, considering that these are four flags of the revolutionary movement that fought against our first colonists. Could revolution, then, be the theme? And yet, their color seems to be too muted to signify the same spirit they aroused in our forefathers, perhaps, deliberately muted so as not to call attention away from the embers, though clearly they are related. At this point we may note that embers have a very delicate nature. They are neither dead, nor are they aflame. They manifest energy, but not in the hurried and impassioned way of flames, whose will to illuminate with pomp and brilliance leaves them sooner extinguished or reduce to a flicker. It is in contrast to this that embers show their virtue. They are neither excited nor inert, and they show their subdued glow much longer. Beyond these observations, scientific mind may further note the analogy to controlled nuclear fission in atomic reactors which, unlike the uncontrolled battle of atoms in the bomb that could only spell doom, spells hope for a future worth living. Thus, the embers, the rings, and the four flags suggest a revolutionary spirit that is defined by restraint. This characteristic is further put across by the square that seems to contain the glow within itself. Such a square by itself already gives a feeling of stability. Seen from a distance, this square functions in another manner, by spreading like a window through which we see signs and meanings that lie underneath. It may be seen as functioning in still another manner, this time carrying our eyes further out ward, as the horizontal of the square is echoed by the line below, including the lower limit of the frame itself, and as the vertical is mirrored progressively by the lines to the right of the square. As we widen our perspective by noting the area outside the central square, we immediately notice the visual interest presented by the right panel, primarily on account of its vibrant reds and blues, in contrast to the gray left. Near the right edge of the frame we notice the first four letters of the Tagbanua alphabet, corresponding to those of the Mangyan alphabet (both read from bottom to the top) near the left edge. We may also perceive the triangle on the left and recognize it, indeed, as the familiar triangle with three stars and a sun with eight rays. Thus, here the Philippine flag functions as the underlying design, or the over-all context of the symbols. But why the whole section in gray? In the light of the considerations we have made previously, it would seem that to use the conventional colors of yellow on a white background would attract our eyes away from the central image and run counter to its implied meaning. Besides, it would also seem that the conventional reading of the three stars and the sun with its disputed eight rays is being avoided, since the task at hand is not a repetition of what every citizen know, but a search for a more powerful and rational symbol. 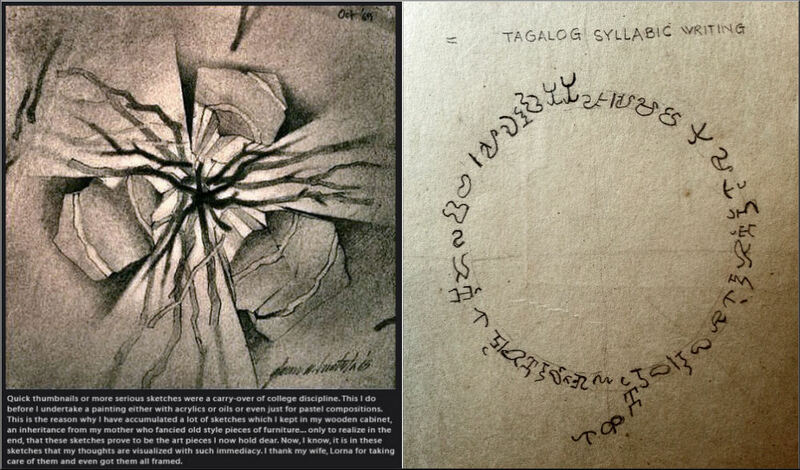 We could thus argue that the two alphabet systems that flank all the other figures represent our living link with our past, in as much as these are aspects of Filipino cultures that have preserved their indigenous, pre-Hispanic identity, well symbolized by these keys to literacy, and thus, knowledge and self-awareness. The use of the Filipino flag as the over-all background and determiner of the color scheme, may well represent the proposition that our disciplined revolutionary spirit which springs from the spirit sparked by our forefathers, takes it meaning from the same ideal as theirs, that is, our national identity. Significantly, I imposed the severe but classic discipline of bilateral symmetry, where elements on both sides of the pictorial field are in one-to-one correspondence with each other, so as to manifest the very control that I wish to communicate. Let us allow our eyes to be guided by the elements once more. The triangle of the Filipino flag points rightward to the central image, and from there our eyes are drawn to the green ring that emanates from the embers, and on to the well-defined reds and blues, whose vertical echoes fade as we reach the right edge of the frame. Because of this directionality to the right, the mural, though only in space, is far from being a static statement. Another set of elements that lead our eyes is the set of vertical, horizontal, and diagonal transparencies that interact each other and meet at the center, touching on all and thus uniting all of the elements. A graphic artist would readily see these lines as realizations of the dynamic and static forces interacting within a pictorial field, such forces being crucial to the problem of establishing an equilibrium of elements. But these transparencies could mean much more, especially to us. Their import lies essentially in the visual difference between only two possible ways of positioning a set of straight lines intersecting at one point. One way is to so position it that no line can be perceived as horizontal or vertical, and the other way is to present a horizontal or a vertical, or both. In the latter case, the vertical and horizontal tend to dominate the entire set, meaning; the spectator more easily notices them and sees the diagonals deviations from the stable norm. The difference between these two ways of presentation lies at the heart of the perception of visual design. For when a diagonal seems off-balance, or not standing upright, and that instead a horizontal seems at rest and a vertical seems rigid and firm, once actually is responding to lines kinesthetically; that is, one draws correspondences between body postures and corresponding states of mind or emotions on one hand, and on the other, line abstractions. And in this mural, we see the vertical and the horizontal clearly made manifest. This may well represent an underlying cross pattern that would appear to bring religion as a factor in the picture, although it is better read differently. 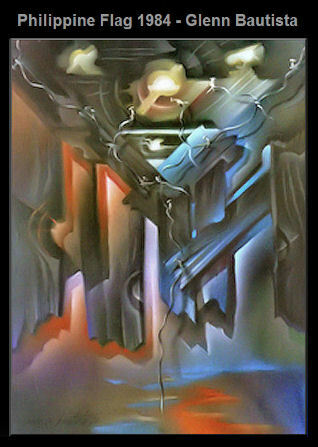 To me, the horizontal transparency represents that relative stability which may come about through the workings of our embers and the vertical transparency implies the spectator (all of us) standing before the mural, thus bringing him into the world of this new symbol. My friend, Eli Pangilinan continued to call me long distance (Glendora, CA – Manila, Philippines) requesting me to do an oil version of an artwork Madame Imelda Marcos own via Pitoy Moreno. It was also interesting to note that the First Lady, Imelda, asked for a discount through Pitoy, to which I replied, “since she is the first lady, maybe, I ought to up the price, right?” Well, she didn’t get a discount, and apparently, I did not up the price. BTW, the sketch and oil painting below tell us of a story. I was twenty-one (21 yrs. old) when I noticed my father, now and then, in a long period of time had been cutting down the trunk ’til the roots of a certain plant, or could have been a tree, that persisted to grow back out from under the earth, out from under the cemented flooring, where the Sunday School class for kids used to meet. He would cut down the plant and cement that said area, hoping that it would never grow back. But to his disappointment, it always grew back – – thus, the title, “Persistence“. Glenn A. Bautista Baytown, TX – United States – Here in Texas, one cannot count the many US flags on display, in front of, and inside their houses. This is probably what makes Texas great – – the love, devotion and nationalism they have for their beloved state and country. So, beloved Filipinos, here’s a version of a very affordable art print, etc of my painting of the Philippine flag that you can hang in your living room. Mabuhay ang Pinoy! Hi Beth, I saw it last when we stayed at Mayon Imperial Hotel, Legazpi City, Philippines . . musta na, sis Beth? Elizabeth Villar Garalde: hi, Glenn! so, where’s the painting now? Elizabeth Villar Garalde: Still feeling great,syempre alaga ni Noli. when i go to Bicol in Nov will ask around in Legaspi about the painting. take care @ kumusta na lang kay Lorna n David. Glenn A. Bautista: Thanks, Beth, I hope the hotel is still there. Yes, even as we age as the years go by, we continue to care for each other even more, life-time mates, ika nga . . until we cross over.